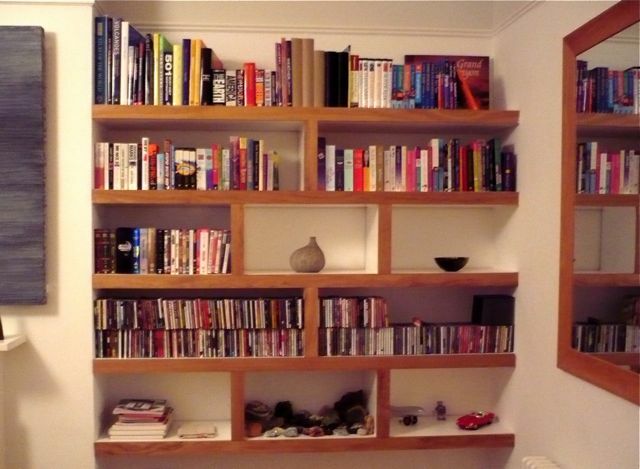 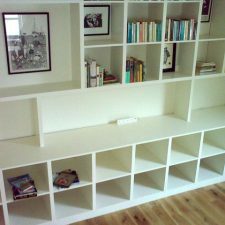 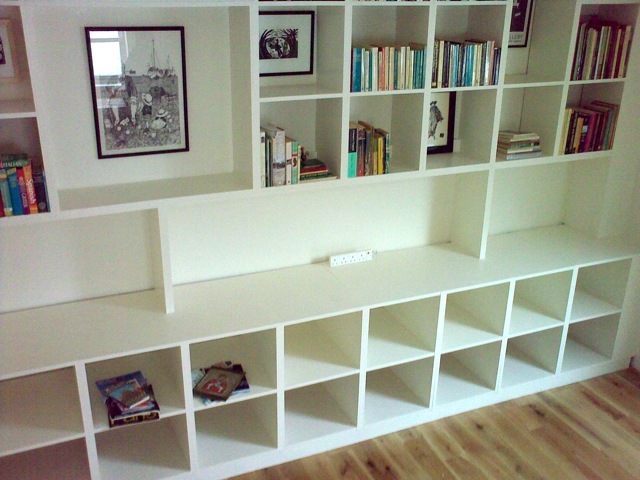 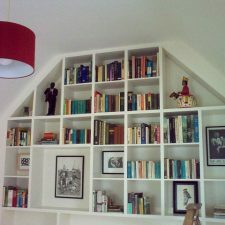 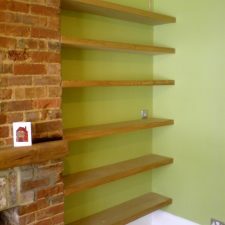 The photos here show some oak-edged shelves I built and fitted this week. 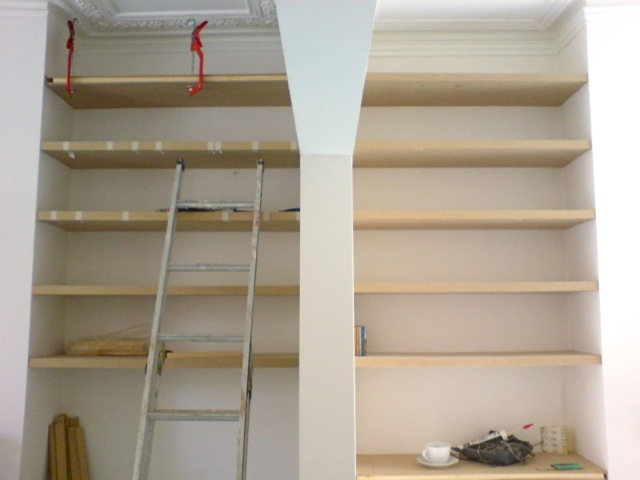 The shelves are to be painted and the oak oiled. 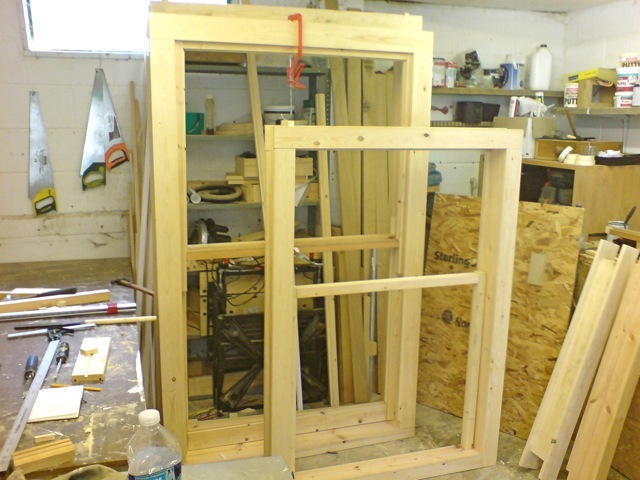 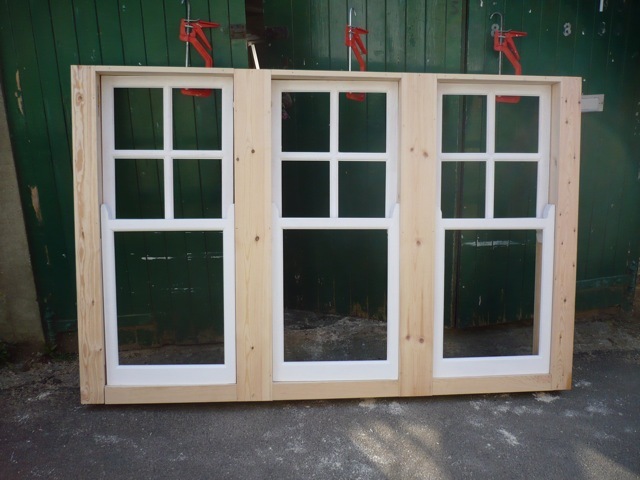 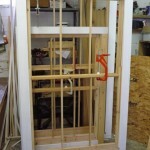 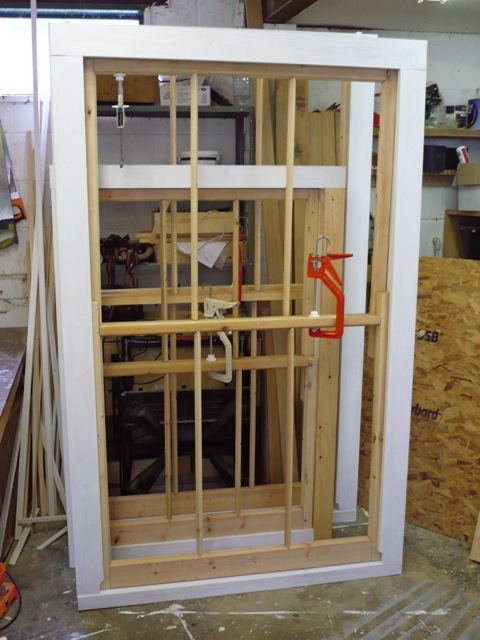 The photos below show a 3-in-one sash window I have been working on. 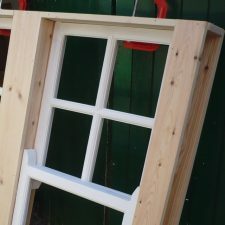 The client asked for a double glazed sash window to match the original style of the windows in the neighbouring properties. 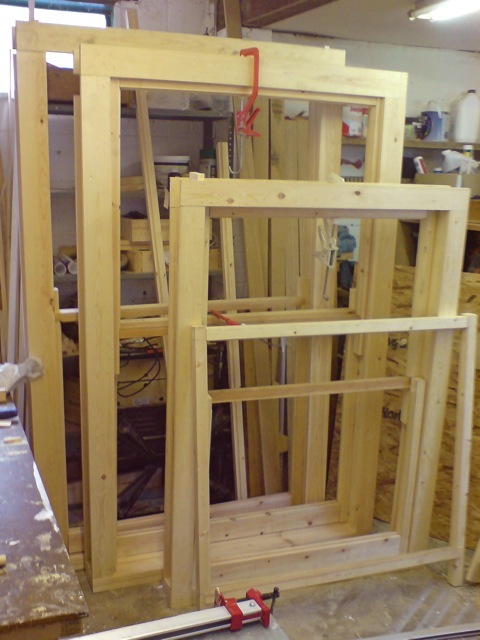 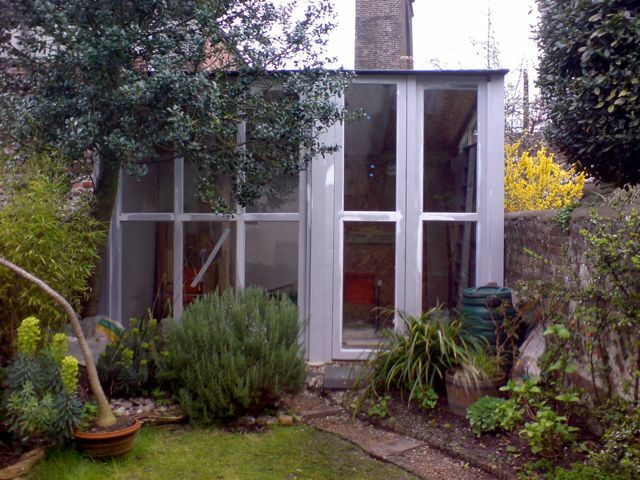 The glazing bars and rails are machined slightly larger than traditional ones to accommodate the double glazed units. 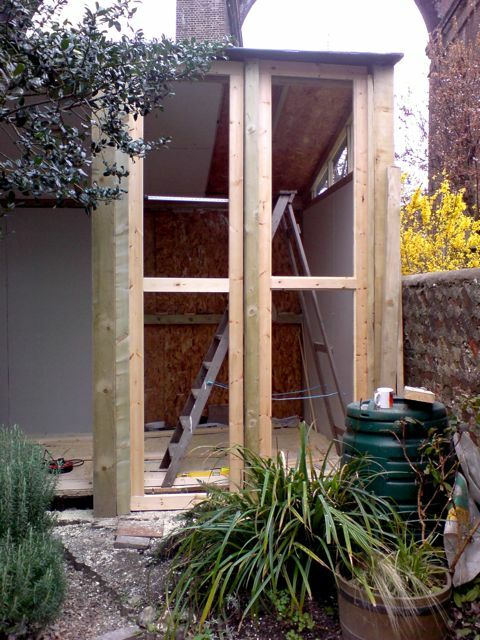 Low-e units and a draught-proofing system are used for improved thermal efficiency. 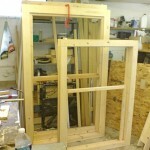 I will add further photographs once the window has been glazed and installed. 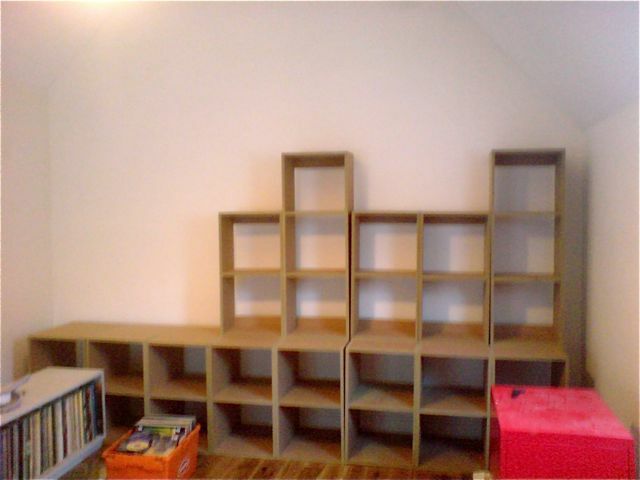 This next project is a whole wall of box type shelving. 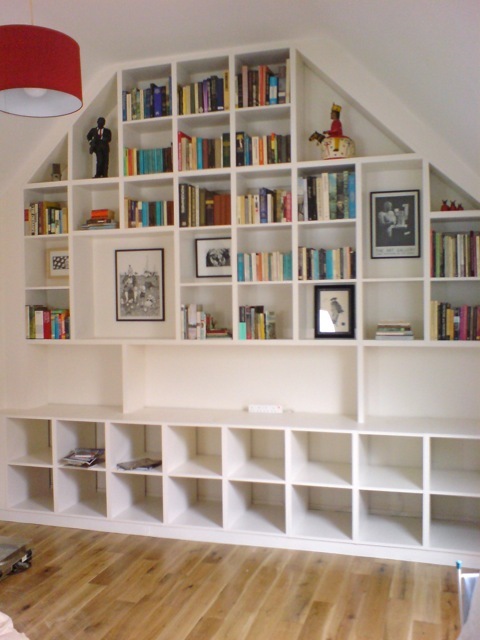 For storage of books and records etc. 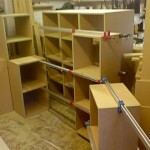 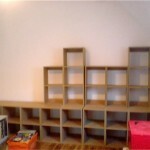 The shelves are constructed as a whole collection of different boxes from moisture resistant MDF. 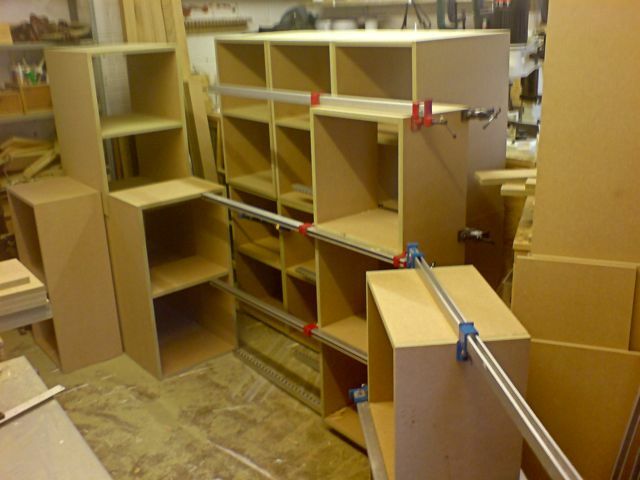 The boxes will be primed and painted and put together to produce a 12′ 6″ high shelving unit. 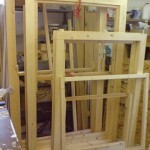 I will add further photographs as the work progresses. 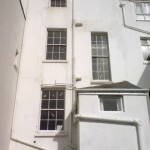 I recently constructed and installed four Georgian style sash windows for a property in Brighton. 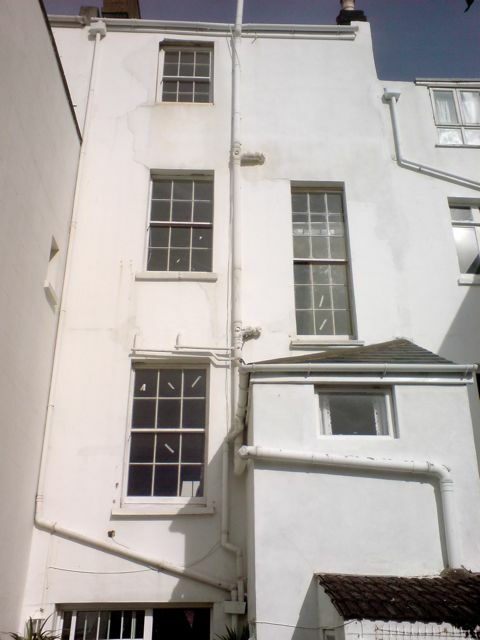 Despite the fact that the house was a listed building, the original windows had been replaced with UPVC windows. 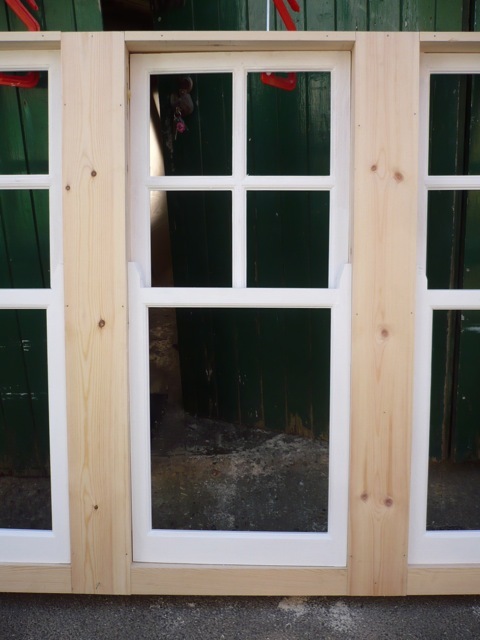 The owners wished to have them restored to the traditional style . 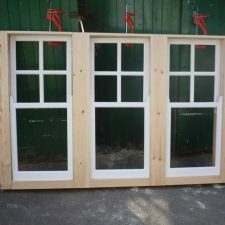 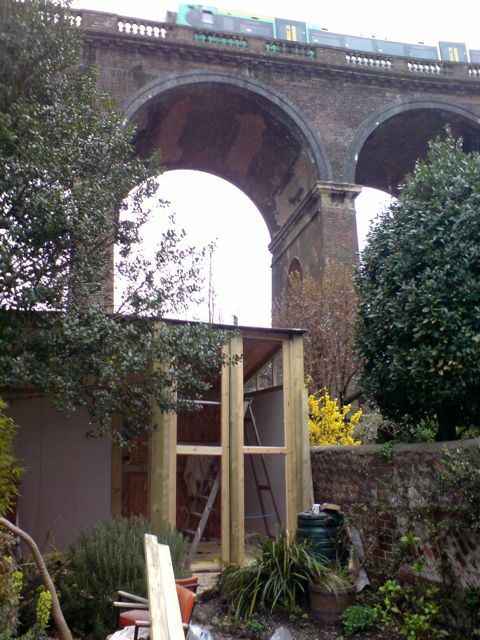 The photographs below show various stages of the construction with the final picture showing the completed windows installed at the rear of the property. 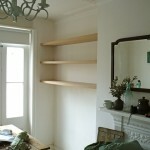 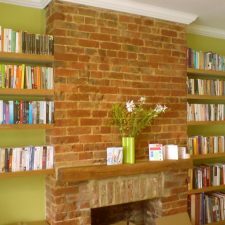 This week I built and fitted 30 floating shelves for clients in Hove. 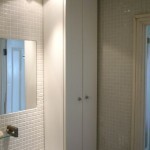 Here are a few photos taken towards the end of the job. 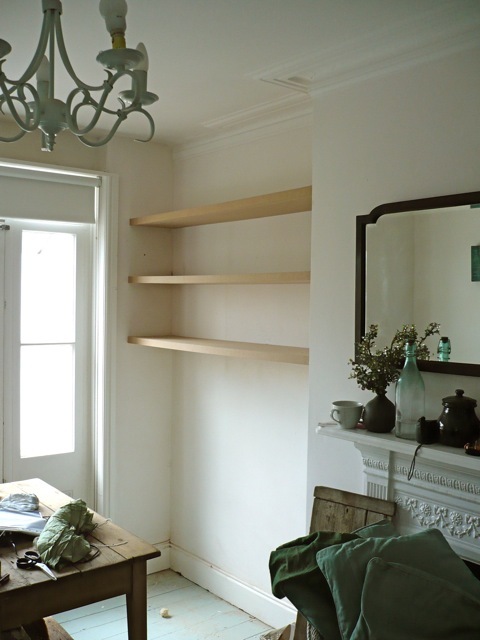 These shelves are constructed from MDF. 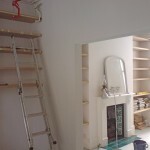 My clients now have the task of painting them. 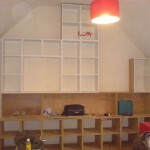 I will post another photo or two when they are finished. 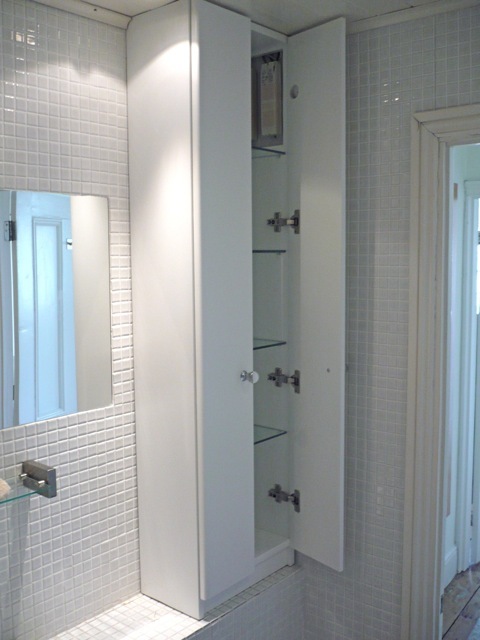 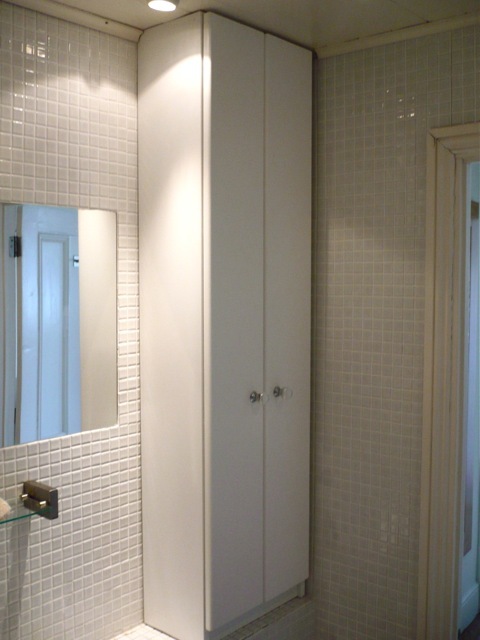 Today I fitted a bathroom cabinet in a property in Hove. 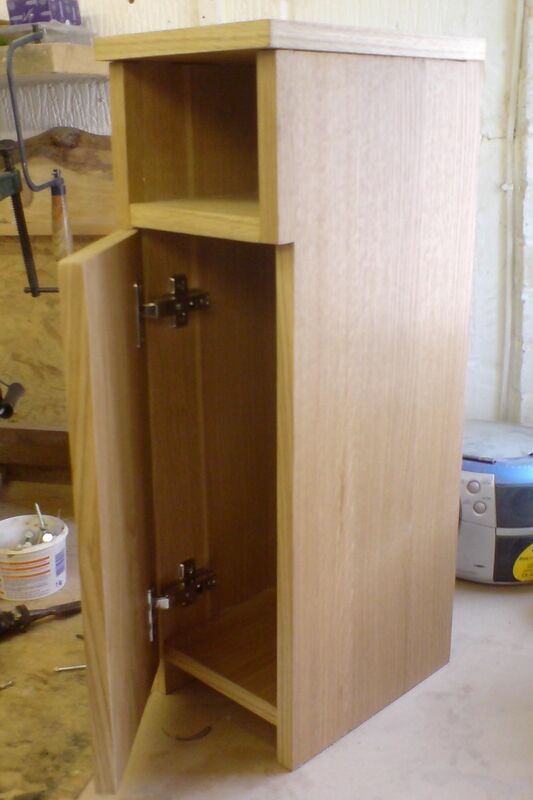 Click images to view a few photos of the cabinet in the workshop and in the bathroom. 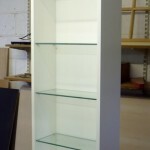 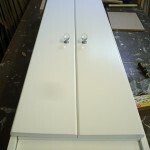 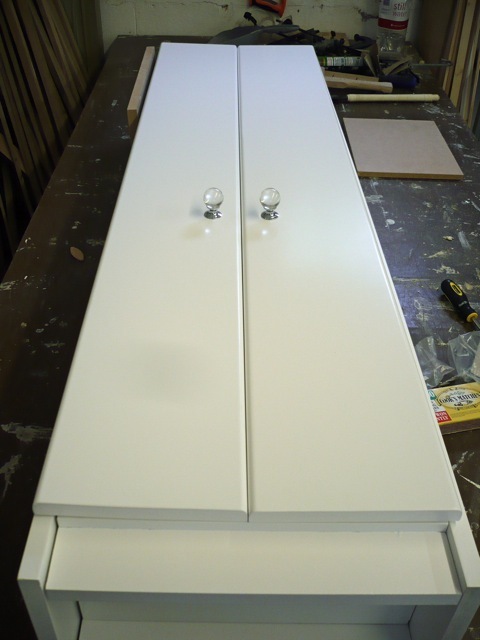 The cabinet was built to the clients specifications with glass shelves and a professionally sprayed finish. 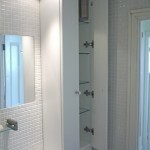 If you would like me to quote for fitted bathroom, bedroom or kitchen cabinets please get in touch. 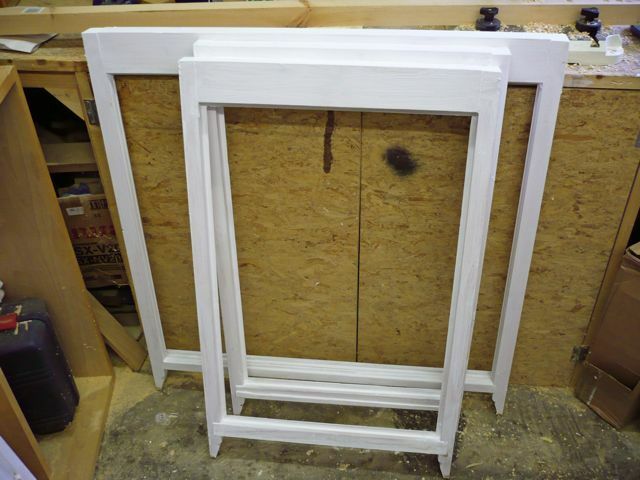 This week I have been working on sash windows again. I often get asked if it is possible to double-glaze existing sash windows. 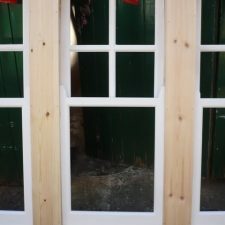 The answer is yes and no, it will depend on the style and condition of the window, and also on whether or not the property is listed etc. 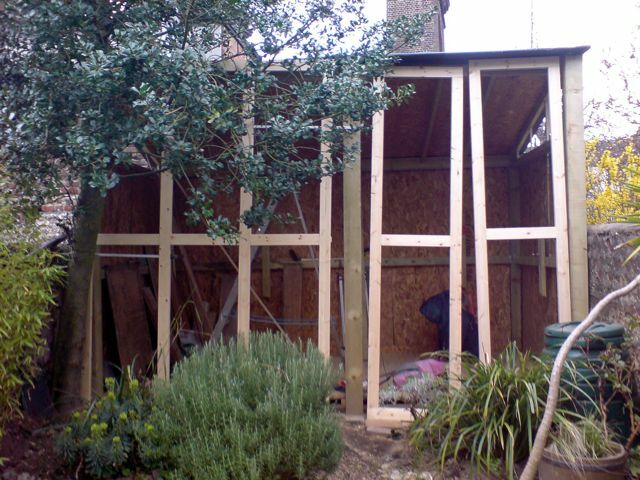 Building regulations also control what can and can’t be done. 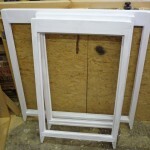 The sashes pictured here have been made to fit into existing frames and support double glazing. 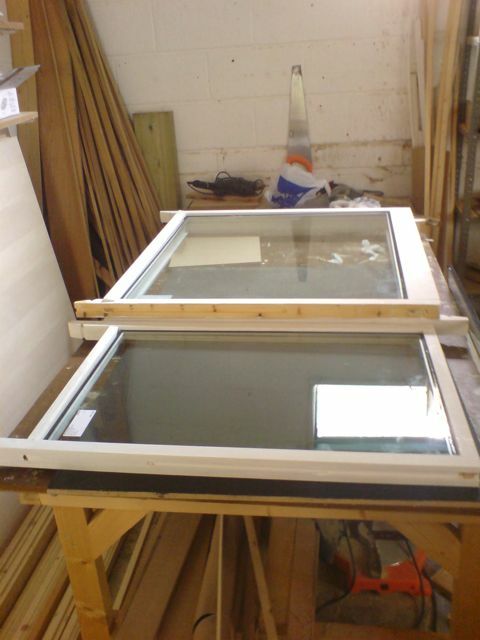 Additional lead weights are used to balance the extra weight of the glass. 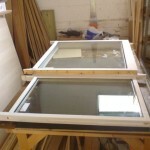 If you have any questions regarding sash window repair, refurbishment or double glazing, please get in touch. 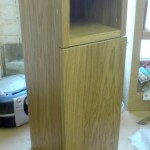 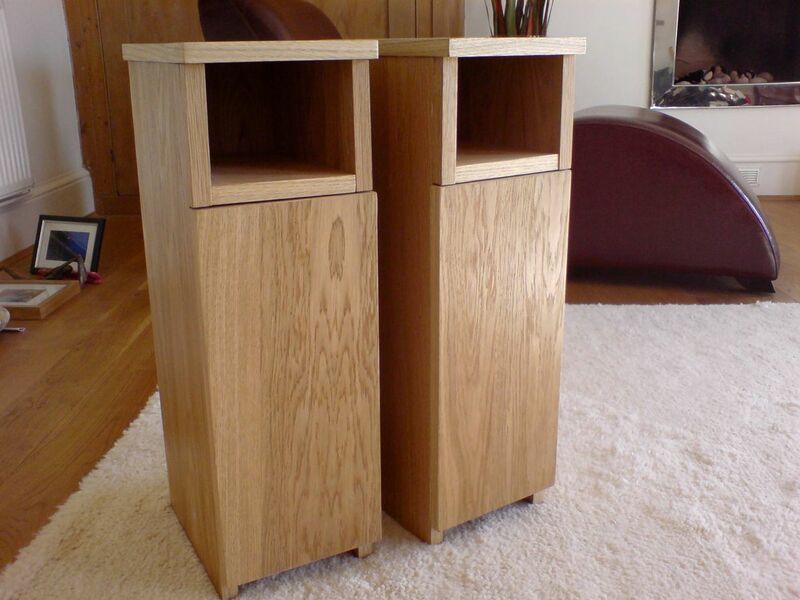 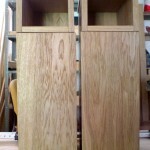 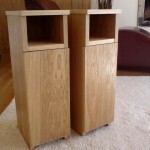 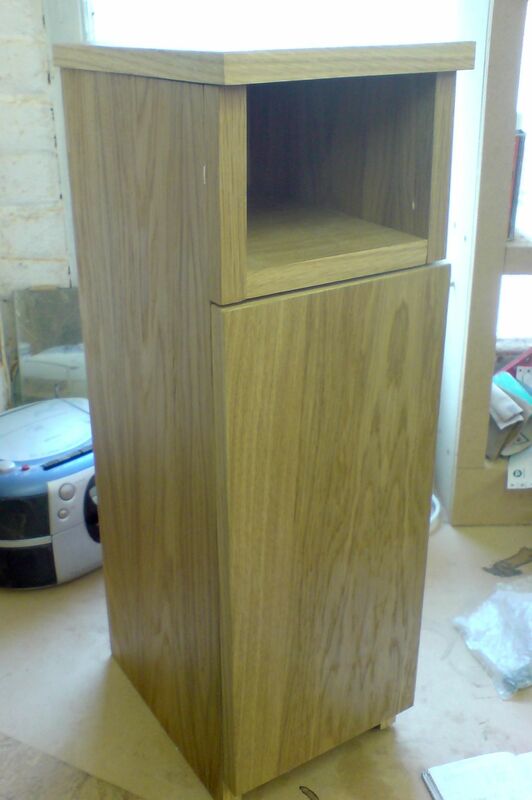 This post is an update to last week’s work in progress, the pair of oak bedside cabinets are now finished. 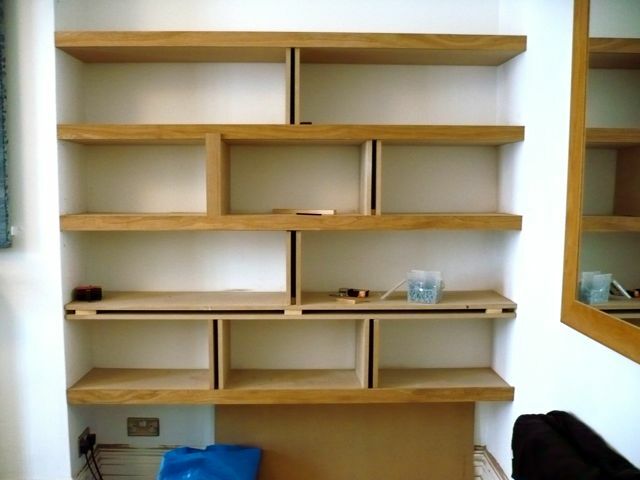 These shelves are made from oak and MDF for clients in Brighton. 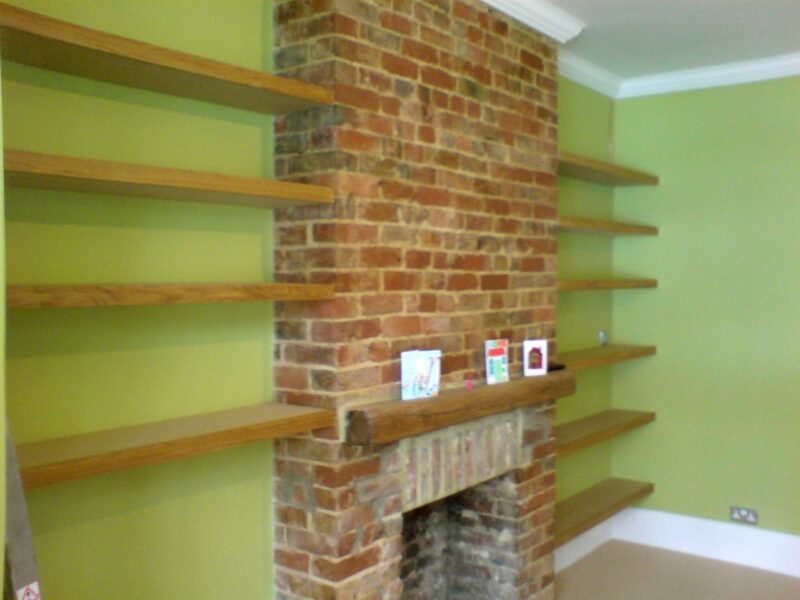 They wanted some shelves to span a six foot alcove. 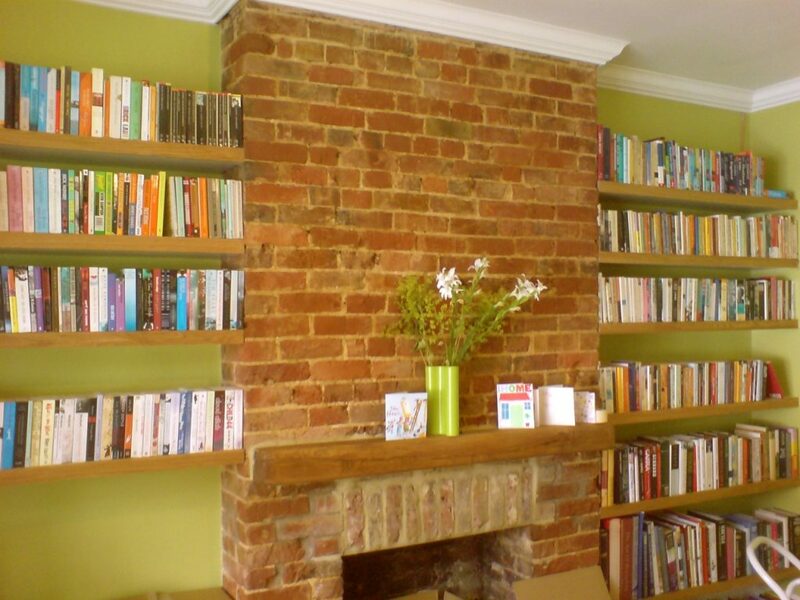 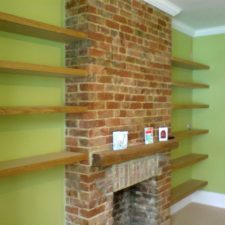 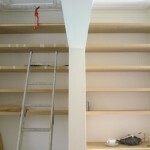 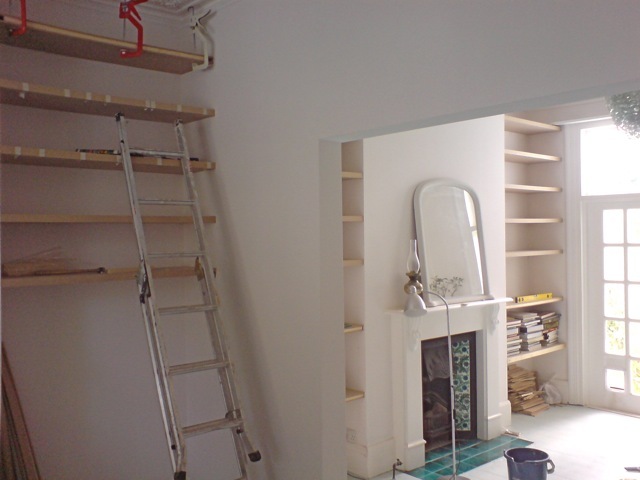 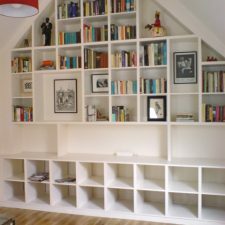 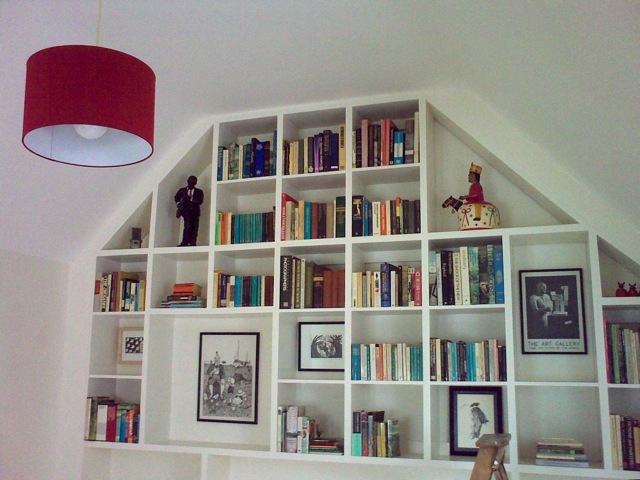 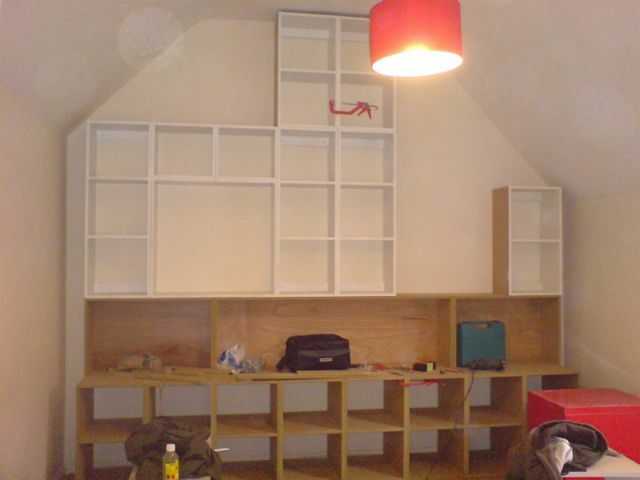 Each shelf is constructed from two boards, each cut to fit between the uneven walls found in older properties. 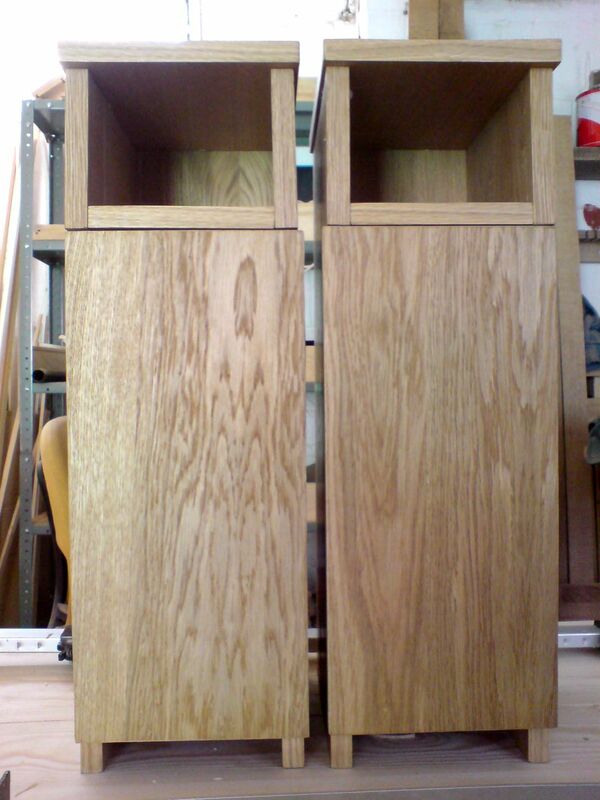 Solid oak strips have been used for the front of the shelving unit. 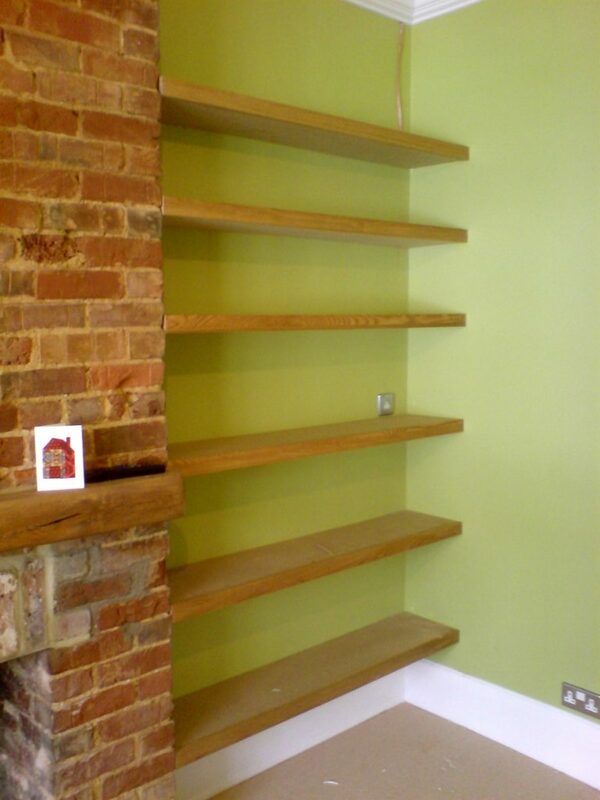 The shelves have been painted and the oak oiled to produce an attractive finish.